This handmade scarf features a repeating pattern of dogwood, a flowering tree tied to traditions of love. 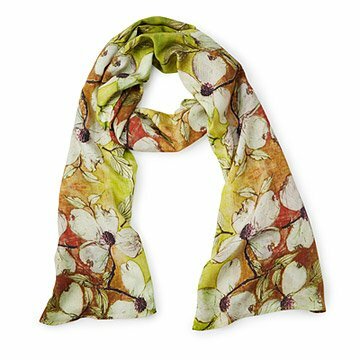 This handmade scarf features a rich, repeating pattern of dogwood, a flowering tree tied to traditions of love and affection. Textile artist Neena Jhaveri portrays the beauty of this legendary flower using clay blocks to create the pattern. Her composition is then reproduced on wearable works of art woven from a silky, high thread count cotton. The luxurious material and classic floral pattern makes this a go-to accessory for any season or occasion. Handmade in India. I have several dresses that are a single solid color and they feel too plain if I don't add something. This scarf is perfect! I'm short so I don't want anything too bulky. It can be hand washed. Beautiful colors that go with a number of things. Beautiful design and fabric. My mother lives in VA so she loved the dogwood design Which is their state flower. Shipped quickly. She will wear it often.